Love is in the air? Not particularly but last year I really didn't get to do all the Valentine's Day nail art I wanted to. Actually I didn't even get close to it so this year I thought I would start a little early that way I can play all I want to. Today I started with a particularly challenging nail art which is the heart watermarble. I was inspired once again by MySimpleLittlePleasures. For those that follow me on Instagram you might have seen my post of a practice marble. This was one of the most difficult watermarbles I have undertaken yet! Mainly because of the use of so many colors and having to move fairly quickly to create my design in the water precisely and before the polish dried. Lordy! However it was totally worth the effort when I finished it! So this watermarble is a great example of why OPI polishes rule! They make watermarbling so freaking easy it's ridiculous! Yup. I know I saw once someone complaining that Pipe Dream Polish was too expensive, which IMO it isn't, just to master watermarble nail art. Lol I want to say you don't need a particular brand to do watermarble nail art just any polish that will spread in the water and play well with the other polishes you chose. So while PDP may be a great brand don't forget you probably already have a lot of other brands of polish in your collection that work just as well so don't give up! To help you on this endeavor I created a little tutorial for this look as well! Wow, the marble looks so great! I love it! 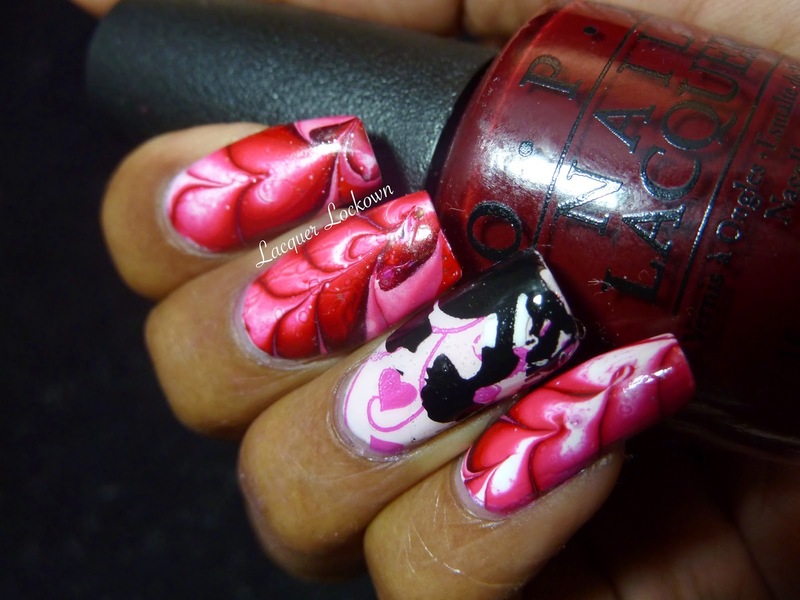 It is not the stamping this time that is stealing my heart, but the marbling (so strange)! That is just gorgeous! I agree, worth the effort. I love how plump and almost 3D the hearts appear! Beautiful! Thanks so much! Lol. I think its because I'm getting better at executing more complicated watermarbles. These were technically very difficult whereas the stamping I did was pretty straightforward.